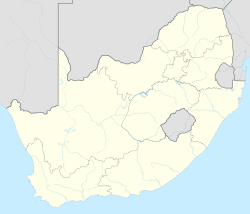 Secunda (from Latin: second, secund, secundi meaning second/following) is a town built amidst the coalfields of the Mpumalanga province of South Africa. It was named for being the second Sasol extraction refinery producing oil from coal, after Sasolburg, some 140 kilometres (87 mi) to the west. During 1974, Sasol (Transvaal) Townships Limited, a subsidiary company of Sasol Limited, was instructed to establish and develop Secunda. After the site for the Sasol complex had been identified, it had to be decided whether or not to combine the existing towns of Evander and Trichardt. The huge burden that extensions of this nature would have had on the financial and administrative resources of the established communities as well as the tempo at which such development should proceed was decisive and resulted in the decision to develop Trichardt and Secunda to be one town, named Secunda. Evander however stayed a separate town. On 28 June 1976, the first town area was proclaimed. 1976 saw the first resident of Secunda moving in. Mr Etienne Prop Smith moved into Tuyshuys, the original house of the farm Goede Hoop, on which Secunda was built. One of the many refineries at the respective plants was the target of two attempted bombings by the African National Congress. The first, unsuccessful bombing occurred in 1980, and the second, partly successful bombing a few years later. Patrick Chamusso was wrongly accused of the first attempt, and as a result of his arrest and torture he became an ANC activist and was instrumental in carrying out the second as part of the ANC's campaign of attacks on South African industrial facilities. This episode is recounted in the film Catch a Fire, released in 2006. Another important factor determining its location, was the availability of water. Water for Sasol is supplied from Grootdraai Dam near Standerton. The layout of the town is unique in the sense that residential quarter cells were laid out which are bordered by main routes and green strips, with the result that only internal traffic is found within such cells. Access to schools, the Central Business District and the suburban shopping centres is made easier for pedestrians and cyclists as the green strips are free from vehicles and the distance to be travelled is shorter. Today distinctive features of the landscape around Secunda are the massive cooling towers, high chimneys and the steel structures unique to the South-African oil-from-coal industry. The highest structure in Secunda is the 301-metre-high chimney at the Sasol Three plant. The chimney is an Eskom type chimney comprising four 301-metre-high (988 ft) refractory brick-lined concrete fluor of 4.6-metre diameter each. The windshield is 292 metres high with an internal diameter of 26 metres. The chimney was constructed by Concor as part of a contract to construct the Sasol Three steamplant with Hochtief. The foundations of the chimney comprised vertical and raked piles. This chimney is one of the tallest free-standing structures in the Southern Hemisphere. Secunda is situated on the latitude 26° and longitude 29° and is 1,620 meters above sea level. It is 180 kilometers from Pretoria, 135 kilometers from Johannesburg, 100 km from Brakpan and 250 km from Potchefstroom. During the summer, Secunda has a very pleasant climate with an average temperature of 26.5 °C. During the winter, the nights are cold, and frost regularly occurs. The days are dry, sunny and warm with an average day temperature of 16.2 °C. The town has approximately 40,198 inhabitants, with an estimated 118,889 people living in nearby township, named eMbalenhle - meaning "pretty flower". The town has experienced significant growth in the past few years due to the expansions underway at the Sasol complexes. Secunda has the 1973 oil crisis to thank for its existence, as it was founded to make South Africa less dependent on the importation of crude oil. It is doubtful whether an industry such as Sasol Synfuels ever formed part of the plans when Sasol One was formed in the 1950s. Sasol Two (1 March 1980) and Sasol Three (10 May 1982), known as Secunda CTL, the largest coal liquefaction plant in the world, produces synthetic fuel, diesel, and related fuels and petrochemicals from coal gasification. :302 Sasol Synfuels (previously known as Sasol Two and Sasol Three) are large industrial refineries, within view, and sometimes earshot, of the town of Secunda. In February 1977 Secunda's first library was opened, located in the kitchen, lounge and dining rooms of a house in Danie Theron Street. At this time a clinic service was also introduced, with personnel of the Transvaal Council for Non-Urban areas visiting Secunda twice a week. The clinic was located in the same house as the library. A permanent service with permanent personnel was established in 1978. On 11 November 1987 an ultra modern library was opened. This library is known as the Jan Coertzen Public Library and has a reference, an adult, children's and a music section as well as an auditorium with conference facilities. In 1994 a community center was completed in Secunda. It was named after Rev. Casper Breedt. A shopping mall was also opened in late 2013, hosting a large Checkers and Game, a 3D cinema and many shops commonly found in a Gauteng mall. A fitness centre owned by Sasol operates in the centre of the business district, and is open to the public. Secunda is also the host town of a casino called "Graceland", a building based on the times of Elvis' American culture. The Waterfront next to the sports stadium also has entertainment. On 3 November 1975, the Health Committee of Secunda was established by means of an Administrative Proclamation, to carry out the functions for local government. At this time Secunda still had no residents. The original Committee consisted of five members. At that stage, the only official was Mr. JF Coertzen, whose job designation was Secretary. He commenced his duties on 1 May 1976 with is office in Pretoria, as the then Chairman of the Committee was stationed in Pretoria and no office accommodation was available in Secunda. On 1 December 1976, the Secretary moved to Secunda and occupied offices, consisting of two rooms in a house situated at No 4 Danie Theron Street. At this time about 150 families resided in Secunda, with more moving in daily. Secunda is now part of the Govan Mbeki Local Municipality (formerly Highveld East Local Municipality) situated in the Gert Sibande District, of Mpumalanga. Secunda is the seat of the municipality. Secunda has three high schools, two of them having started out with Afrikaans language education: High School Oosterland, and High School Secunda. The third, Highveld Park High School was founded with English as the language of education. Now the two formerly mentioned offer both languages. ^ a b c d "Main Place Secunda". Census 2011. ^ "STATS SA - Secunda". Statistic South Africa. 2011. Retrieved 2 January 2017. ^ "STATS SA - Embalenhle". Statistic South Africa. 2011. Retrieved 2 January 2017. ^ a b Erasmus, B.P.J. (2014). On Route in South Africa: Explore South Africa region by region. Jonathan Ball Publishers. p. 401. ISBN 9781920289805. ^ "Operational developments during the establishment of Secunda Collieries" (PDF). South African Institute of Mining Metallurgy. 86 (5): 161–66. 1986. This page was last edited on 15 April 2019, at 17:40 (UTC).